Try as I might I cannot better the ‘Bard of England’ with a title for this little tome. 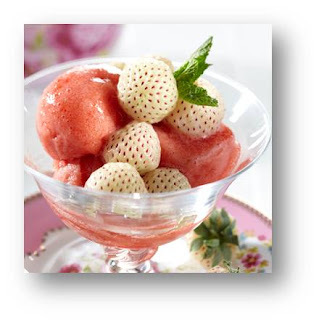 However, the one thing guaranteed about a strawberry by another name is that it is exotic, has an exceptional tropical flavor and is over here creating a bit of a stir in restaurants up and down the country. The pineberry is of course a hybrid plant which yields a fruit not too dissimilar to a strawberry. Whereas a strawberry has red flesh and green/white seeds the reverse is true of the pineberry plant. The berries are smaller than strawberries and as such are more expensive to buy than traditional strawberries. The name is derived from the fact the aftertaste is slightly similar to pineapple, and although the aroma and taste is delicate and fragrant, the cost has been a prohibitive factor in this fruit becoming popular - till now. The cost of the fruit when purchased in a restaurant is expensive; after all, when sold in stores such as Waitrose the cost per pound in weight can be as much as £14.00. For the average family the cost is prohibitive; however, it is not a case of profiteering on the part of the supermarket. A combination of small scale farming and low yield crops of small berries, mean it is never going to be as cheap as traditional fruits we can buy in the supermarket or grow in our own gardens. Thankfully you don't have to take out a second mortgage to enjoy this superb and very unique fruit; simply grow it at home. These hardy little plants are extremely resistant to disease and can be grown in the ground or, as many people are doing, grown in pots above ground level. If you want to have something a little unusual in your garden it is difficult to find something more unusual than this. The plants are very hardy as mentioned and can withstand frost to as low as minus five degrees. Planted in pots, they can be moved indoors to a garage, conservatory or greenhouse if the temperature looks like dropping lower. The plants crop a little earlier than traditional strawberries around early June. If you want to put a little something on the table which is different, the fruit of the pineberry is definitely different and unusual. They are in effect little different to strawberries and should be treated as such. The scent of the plant and flowers is not overpowering but is a fragrant addition to a garden, something a little different. However, there are few places where you can buy these beautiful little plants which deliver a vibrant flavor to your taste buds. There are one or two specialist centres up and down the country, and you can also obtain specialist advice to help make your new crop a success. Sitting in your garden on the patio in the summer, you can guarantee these little beauties will be a topic of conversation for anyone joining you. Graham Green is a freelance writer, blogger and researcher. He has tasted pineberry fruit once and was rather intrigued. So much so he thought it was a good April fool joke till he was shown the plant in a pot in his friend’s garden.